What’s your view of the 2015 general elections? All I can say is to wish Nigerians well. But I am not an enthusiast of the elections because I believe that they were mismanaged, especially the presidential election. It was computed by some diabolical forces to reenact a Hausa/Fulani oligarchy in Nigeria. I am not going to talk much about this now. I am going to talk about it in about one or two months’ time because I don’t want to be seen as disrupting what has been done so far in terms of ensuring peace and smooth transfer of power from the Peoples Democratic Party to the All Progressives Congress. For example, what has the card readers got to do with our elections? Prof. Attahiru Jega said it was in line with recent technology. Which technology? The card readers were apparently used to manipulate the elections. There was also underage voting in the North and nothing was done by Jega. But there were violence and allegations of electoral manipulations in Akwa Ibom and Rivers states where the PDP won in a curious landslide. Are you going to compare that with the 1.999 million votes recorded in Kano State for Buhari? Kano State is a politically turbulent state. The people there are politically enlightened. I have been there before in those days of the Unity Party of Nigeria. In those days when Chief Obafemi Awolowo visited Kano, we were always greeted by a mammoth crowd but we never deceived ourselves because we knew that the ‘talakawas’ in Kano dictate the pace. The PDP was in the state before the APC. But President Goodluck Jonathan lost in Aso Rock polling unit; does this not reflect a general rejection by the masses? In the natural course of events, we in the PDP have put in 16 years in government and we must, naturally, attract the attention of the masses. But I don’t see it as an act against Jonathan. Jonathan is a good president for Nigeria and he remains so until May 29. He is a young man and he ruled Nigeria with the fear of God and not a single person went into exile during his administration. Not a single person was murdered when he was in government. You will see what will happen and very soon we will see deaths of individuals. It has started happening. The REC of Kano, wife and two children were roasted to death. I don’t know the reason why that happened. No matter what it is, it is a bad omen. But the deaths of the Kano REC and his family happened during the Jonathan presidency. More so, Buhari won in Kano. So, is it unlikely the REC would be killed by the APC. But it happened during the election of Buhari. I have heard it advanced; I am not a law enforcement officer or an intelligence office but I had heard that the REC had protested that the figures that came out from Kano State did not emanate from his office. Somebody burnt the house of the REC. Yet there was not a mark of burning on the bodies of the man, his wife and his two children. It is believed that they were suffocated by the fume. Were they suffocated in the burning house? If they were suffocated in the burning house, their bodies would have been burnt to ashes. You are an apostle of the late sage, Chief Obafemi Awolowo, who in his lifetime tried to get the Yoruba into the mainstream of national politics. What do you think would be Awo’s point of view about where the Yoruba are in national politics today? Papa was playing politics the way any decent person and nationalist will play politics. His Yoruba people knew him when he was Premier of Western Nigeria. They knew he performed well. Papa has never advanced the argument that the Yoruba must be left out of government. I have always quarreled with my colleagues in the PDP who are saying that, even when Chief Olusegun Obasanjo was president. I don’t believe in the mainstream nonsense. So, nobody ascribed any tribal feelings to Awolowo when he was propagating his ambitions. He had supporters all over the country. So, the Yoruba who are in the APC will now be part of government. I wish them the best of luck because at the end of the day, the Yoruba will be free to judge them if they have performed or not. It is not a question of mainstream or no mainstream, it is a question of popular participation in a government that belongs to Nigerians. I asked that question against the backdrop of the fact that the leader of the APC, Bola Tinubu, is touted as the new leader of the Yoruba, having helped in getting the Yoruba nation in mainstream national politics. Was it Tinubu that did it? I know Bola very well. I always tell people, when I got married in 1972, Bola Tinubu contributed 10 pounds to my bachelor eve. I know him very well in terms of his politics of rigidity and stubbornness but he will destroy himself if he says he is Yoruba leader. Who made him leader? His party went into the contest. One, he played a key role in it, good for him. But to say he is Yoruba leader, honestly, I will not wish him evil but success but he should never in his lifetime make the mistake of saying that he is Yoruba leader. In 1951 when Papa Awolowo became the leader of the Action Group, he didn’t force himself on the party, it was people like Papa Maja, Doherty that said you young man, you have done very well as the general secretary of the party, go ahead and provide leadership and Papa provided leadership. But if Bola Tinubu will glorify on this election and call himself Yoruba leader, I wish him well. He is younger than me, so he should not fool himself nor join that charade to say he is Yoruba leader. Yoruba people respect maturity, age and experience and they know who their leaders are. Who then is Yoruba leader? That term is not proper and not in vogue now. Yoruba leader to do what? The Yoruba have many ways to defend their interests. They don’t need any one to come out and say he is a leader. Papa Awolowo never said he was Yoruba leader. In all occasions when Papa had led, people ascribed leadership to him. Even people in the opposition such as Chief Richard Akinjide said let Papa Awolowo lead the Yoruba. But so the Yoruba have many ways to fight for their interest because you cannot cheat the Yoruba and get away with it. If you do that you are going to smash yourself to pieces. We don’t need this kind of Yoruba leader. President Goodluck Jonathan said he was caged in the last six years? To rule Nigeria is not easy. As the father of all, he represents the interest of all Nigerians. In that place, he would only know what was brought to him. I think that was what he meant. Buhari is coming to power now, so I wish him good health. President Jonathan was speaking the truth. He was caged for many years. What do you foresee of Buhari and Obasanjo relationship? Many of them who are jumping up and down now will know better when Buhari must have finished dealing with them. Buhari is a Fulani man from Daura. The northern agenda to get rid of southern leadership started in the 2011 elections. Obasanjo had his reasons. He supported Jonathan to succeed Yar’Adua and he was the same person that said Jonathan should go. As an individual, he has his rights. I am told he has been given three ministerial slots. It could be more than that, so let him go ahead but it does not stop Obasanjo tomorrow to take his biro to wipe Buhari clean and clear but the difference is that when he is fighting Buhari, he will be fighting a different kind of opponent. Buhari is a Fulani; I keep on saying that and they are very rugged and tactical in their approach to power. It is going to be an interesting fight but it is going to come. We in the PDP are waiting because we are returning to power in 2019 and luckily for us, we are going to bring out a candidate from the North to face Buhari. Some in the APC have been deceiving themselves that Buhari is not going to run for a second term. They say he’s going to do a term and I laugh at them. If God gives Buhari strength and power and I wish him that, he is going to run for a second term and we will pitch a Hausa/Fulani against him. Won’t that mean that you are going to ditch the South-South and President Goodluck Jonathan? I know President Jonathan will not contest. I know that because when people were saying he should not contest in 2015, many of us said no, he must contest. But in 2019, Jonathan would not contest. He is a gentleman and I have said it that after he leaves office, I will visit him at Otuoke to greet him and if he has a place for me, I will sleep there. He has been a very wonderful president. He has left a record that is worthy of emulation. Jonathan will not contest again even if the South-South leaders say so. Can you put the relationship between Awolowo and Buhari in proper perspective? Buhari didn’t imprison Papa Awolowo. What he did was that he got all the associates of Awolowo arrested and caged. I spent 21 months in Buhari’s prison. All he did to Baba was a kind of subtle surrounding of Awolowo’s residence with soldiers. He stationed them in Shagamu but the soldiers were moving to Ikenne to virtually terrorise Awo. Papa was told to be reporting to the police station. Mama HID Awolowo accompanied papa to the station. A few days later, papa’s house in Ikenne was searched and the military announced that they got a master plan for Lagos State in papa’s house. 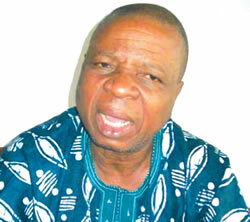 What’s your opinion on the sacking of the Inspector-General of Police, Mr. Suleiman Abba? I don’t know why he was sacked. Look at the crisis in Ekiti State, for example. He was the custodian of the security situation of the country. Look at what is happening in Ekiti. A group of APC parliamentary charlatans broke open the doors of the Assembly and started announcing funny things. Governor Ayo Fayose has proved to the world that he is control and that his people are with him. Even with the seven minority lawmakers of the PDP impeaching the substantive Speaker who has 18 members in his support? It’s a pity. I don’t know what to say. I want to warn the APC. I was born in Ekiti and my father spent many years there. Nobody has come out to raise the issue of propriety or impropriety of sacking the Speaker. It’s because the APC did not put its house in order and that is why you have the elements doing that. But Fayose has been supporting the seven PDP lawmakers, denying the 19 lawmakers in the majority their allowance? That is not correct. I don’t know the point of that but I will not give my money to my enemy to destroy me. I will not do that. Fayose is right and many PDP members are also with Fayose. They said they want to impeach Fayose. I want to advise the APC to be very careful because if they are not, they might destroy themselves. You have driven us to the wall and when we have no more place to go, we will fight back. Fayose and Mimiko are the only governors of the PDP left in the South-West and you are creating problems upon problems. This is why we are supporting Fayose.